JUSTINIAN'S restoration of the Roman Empire in the West in A.D. 554 is a landmark in history. For a brief moment, both "legs" of the old Roman Empire — East and West — are under his personal control. But Justinian's history-making restoration barely survives him. With the great Emperor's death, the Eastern Empire, with its capital at Byzantium, falls into a period of weakness and decline. At home, civil and religious strife tear at the fabric of society. To the east, the Persians renew their wars. To the west, the Germanic Lombards invade and conquer much of Italy. Justinian's "Imperial Restoration" crumbles into the dustbin of history. Though dying of lethargy, the Eastern Roman Empire, long since known as Byzantium, continues to be recognized as the eastern successor of the old Roman Empire. This weakened eastern leg will stand precariously for another millennium. Meanwhile, papal Rome turns its eyes toward Western Europe. There, a powerful kingdom to the northwest is on the rise — the kingdom of the Franks. The Franks earlier had settled along the Rhine after migrating up the Danube River. It will be under Frankish tutelage that the western leg of the Roman Empire will rediscover its vitality and strength. The Frankish tribes are ruled by a royal family of kings known as the Merovingians. The Merovingians claim direct descent from the royal house of ancient Troy. The Merovingian rulers possess an unusual mark of authority. All the kings of this dynasty wear long hair. They believe that their uncut locks are the secret of their kingly power, reminiscent of the nazarite vow of Samson in the Old Testament (Judges 13:5; 16:17; see also Numbers 6:5). The Merovingian dynasty had been founded by Clodion in A.D. 427. But its most famous ruler is Clovis (481-511). Later historians will consider Clovis to have been the founder of the Frankish kingdom. On December 25, 496, Clovis is baptized a Catholic, along with 3,000 of his warriors. He thereby becomes the first Catholic king of the Franks and the only orthodox Christian ruler in the West. Upon Clovis death in 511, his kingdom is divided among his sons, who further enlarge its borders. The Frankish kingdom rapidly becomes the West's most powerful realm. With the passage of time, however, the old line of Frankish kings grows weak. The decadent Merovingian kings succumb to luxurious living. They will be designated by French historians as les rois fainént — "the enfeebled kings." During this period, the real power of the Frankish kingdom lies in the hands of the court chancellors, who are known as major domus regiae, or "mayors of the palace." It is now 751. Pepin (or Pippin), surnamed Le Bref ("the Short"), holds the office of mayor of the palace under the Merovingian king. Pepin, of course, is also a German Frank by blood and speech. Pepin the Short is ambitious. He is not content to be merely the king's chief minister or viceroy. He covets the office of king itself. Pepin asks Pope Zacharias for an opinion on the legitimacy of his bid. The Pope replies that "it is better that the man who has the real power should have the title of king instead of the man who has the mere title but no power." In November 751, Archbishop Boniface, the papal legate, anoints Pepin king of the Franks at a gathering of Frankish nobles in the Merovingian capital at Soissons. Pepin is now "God's anointed" and the Merovingian king Childeric III is deposed and imprisoned. His sacred flowing hair is ritually shorn by the command of Pope Stephen 11 (752-757). The power of the Merovingians is broken! Childeric is sent to a monastery for the rest of his days. The Merovingian bloodline, however, will survive, through intermarriage, in the line of the dukes of Hapsburg-Lorraine. The Merovingians have reigned by right of conquest. But Pepin has now assumed the sovereignty in the name of God. He believes it is God's will that his family rule the Franks. Pepin accordingly styles himself rex gratia Dei ("king by the grace of God"), a title retained by his successors. Pepin's new dynasty will be known as the Carolingians. The name derives from Pepin's father, Charles (Carolus) Martel, who had been mayor of the palace before him. It had been Charles Martel ("the Hammer") who saved Europe from the invading Saracens at Tours, in France, in October 732. By that momentous victory, the Franks had become widely recognized as the real defenders of Christendom. The Papacy had long since realized that Constantinople could defend no one. The Church now looks to the Carolingians for protection against the Germanic Lombards, who are occupying much of Italy — and want the rest! The situation becomes desperate. As the Lombards threaten Rome, Pope Stephen II sets out across the stormy Alps in November 753. His goal is Pepin's winter camp. The Pope asks Pepin to come to his aid. The Church must be protected from the encroachment of • the Lombards! At the same time, Pope Stephen personally anoints and crowns Pepin, and blesses Pepin's sons and heirs. The Franks answer the call. Pepin invades Italy and defeats the Lombards. He then confers the conquered Lombard territory upon the Pope (754). This gift of rescued lands is called the "Donation of Pepin." It cements the alliance between the Carolingians and the Church. Pepin dies in 768. His sons Charles (Karl) and Carloman jointly succeed to the Frankish throne. In 771, Carloman dies suddenly, and Charles becomes sole king of the Franks. Though only 29 years old, Charles is an imposing figure. He literally exudes power and authority! Charles is 7 feet tall — well over a foot above average height — and robust. He is stately and dignified in bearing, but is known for his warm-heartedness and charity. He speaks a type of Old High German. But most important, he is a zealous and dedicated Catholic Christian! Now in undisputed possession of the Frankish throne, Charles directs his efforts against the enemies of his kingdom. His great goal is to reestablish the political unity that had existed in Europe before the invasions of the fifth century. He first launches a campaign against the fierce Saxons, who are threatening his frontiers. The Saxons are the last great pagan German nation. During the next three decades, Charles will wage 18 campaigns in his costly and bitter struggle against the stubborn Saxons. In 804 they will finally be Christianized at the point of the sword and incorporated into his empire. Charles also undertakes campaigns against the Bavarians, Avars, Slavs, Bretons, Arabs and numerous other peoples. During his long career, he will conduct 53 expeditions and war against 12 different nations! And in the process he will unite by conquest nearly all the lands of Western Europe into one political unit. Pepin had delivered a crushing defeat to the Lombards, but he had not totally subdued them. The Church is now threatened once more. Rome needs a champion! In 772, Charles receives an urgent plea for aid from Pope Adrian I, whose territories have been invaded by Desiderius, king of the Lombards. Charles crosses the Alps from Geneva with two armies. In 774 he decisively overthrows the kingdom of the Lombards, deposes Desiderius and proclaims himself sovereign of the Lombards. Charles is now master of Italy! Charles takes the title Rex Francorum et Longobardorum atque Patricius Romanorum ("King of the Franks and Lombards and Patrician of the Romans"). The famous "iron crown" of the Lombards — which will become one of the great historic symbols of Europe — is placed upon Charles' head. It will be used in subsequent centuries by Napoleon and other sovereigns of Europe. Charles confirms and expands the Donation made to the Papacy by his father. This territory will later be known as the States of the Church. Italy is again united for the first time in centuries. Charles is heralded as defender of the Church and guardian of the Christian faith. The Frankish monarchy and the Papacy stand in partnership against the enemies of civilization! Charles is now the most conspicuous ruler in Europe. History will know him as Charlemagne" Charles the Great." It is 795. There is a new Pope — Leo III — in Rome. He immediately recognizes Charles as patricius of the Romans. By now, Western Christendom fully recognizes the bishop of Rome as its head. But there are elements within the city of Rome itself that wish to see Leo deposed and another candidate crowned as Pope in his stead. In the spring of 799, Pope Leo is accused of misconduct. Adultery, perjury and simony are among the charges. He is driven out of Rome by an insurrection, and is granted refuge at the court of Charlemagne, protector of the Holy See. Charlemagne reserves judgment, and has Leo escorted back to Rome. In November 800, Charlemagne himself comes to Rome to investigate the charges. A bishop's commission of inquiry into Leo's conduct is set up. Charlemagne presides over the tribunal. Pope Leo swears on the Gospels that he is innocent of the crimes alleged against him. The judgment of the tribunal is in his favor. Leo is formally cleared and reinstated on December 23. On the same day, emissaries from Harun al-Rashid, caliph of Baghdad, arrive in Rome with the keys to the Holy Sepulchre in Jerusalem. (Jerusalem lies within the extensive domains of the caliph.) The keys are officially presented to Charlemagne. This act symbolizes the Moslem caliph's recognition of Charlemagne as protector of Christians and Christian properties. Charlemagne remains in Rome for the Christmas holidays. On Christmas Day, A.D. 800, the king of the Franks attends a service in St. Peter's Basilica on Vatican Hill. The stage is now set for one of the great scenes. of all history. Charlemagne kneels before the altar in worship. There is a dramatic hush in the church. As the great king rises, Pope Leo, without warning, suddenly turns around and places a golden crown on the monarch's head! Immediately the assembled people cry in unison: "Long life and victory to Charles Augustus, crowned by God, great and peace-giving Emperor of the Romans!" The Pope has crowned Charlemagne as imperator Romanorum — "Emperor of the Romans"! Something profound has occurred. The West once more has an emperor! Historians will look back on this as the central event of the entire Middle Ages. The coronation of Charlemagne marks the restoration of the Western Roman Empire — the first revival of Roman Europe since Justinian. Charlemagne is now officially a successor of the Roman emperors. The tradition of the Roman Caesars is revived. In Charlemagne, Western Europe now has a Christian Caesar — a Roman emperor born of German race! The act also demonstrates that the memory of the once — great Roman Empire still lives as a vital tradition in the hearts of Europeans. Historians will view Charlemagne's coronation as the beginning of what will be known as the Holy Roman Empire. The political foundation of the Middle Ages has been laid! Charlemagne is ruler of nearly all the territories that had once constituted the Western Roman Empire. He has more than doubled the territory he had inherited from his father and brother. All France, nearly all of Germany and Austria, and all of Italy except the kingdom of Naples are his! Under Charlemagne's scepter Western Europe for the first time in centuries has something approaching unity. A new Roman Empire — a new Europe — has been born! In 803, Charlemagne will stamp on his seal the words Renovatio Romani Imperii — "Renewal of the Roman Empire." There is yet another significance to the events of December 25, A.D. 800. Charlemagne has received the imperial crown at the hands of the Pope! The populace see it as having come from God. The message is clear to all: The imperial crown is a papal gift. The kingdoms of this earth belong to the bishop of Rome; they are his to give — and to take away! This assertion will often be challenged in following centuries, and will have tragic consequences when kings and Popes wage war against each other. But it leaves an indelible impression on the minds of Europeans. Charlemagne has been taken unawares. He is reported to have grumbled that he would not have gone to church on that day if he had known the Pope's intentions. The Emperor is not unhappy about being emperor. His misgivings are over the manner of the coronation. He has won his empire on the battlefield through military genius; he does not owe it to a Pope. Yet Leo has made it to appear so! Whatever his doubts, Charlemagne makes no protest. He quietly accepts the imperial crown from Leo. The Pope has cleverly executed a "coup." In the eyes of all, the Papacy has been symbolically exalted above the authority of the secular power. A great legal precedent has been set. Charlemagne holds no grudge. Pope and Emperor have too many interests in common to permit ill-feeling to exist. There has been a "marriage" formally linking the spiritual power of the Pope with the temporal power of the Emperor. The two are joint sovereigns on earth. As head of the recreated empire of the West, Charlemagne presides over a new society born of the union of Roman and German elements. Charlemagne is a German, but he is inspired with the spirit of Rome. The Emperor organizes his empire on the pattern of the old Roman model. He prizes the traditions of ancient Roman civilization. His Romano-Germanic society will set a precedent for future European monarchs. Charlemagne's capital is the German city of Aachen (Aix-laChapelle). Following his coronation, the Emperor spends the remaining years of his reign there in comparative quiet. He becomes a patron of learning and the arts, importing scholars from throughout Europe to study and teach at his court. In 812 — two years before his death — Charlemagne receives news from the East. Eastern Emperor Michael I at Constantinople has swallowed his pride and recognized Charlemagne as co-emperor. The equality of the two halves of the Empire is now official. For all intents and purposes, however, the two "legs" of the Empire are completely autonomous. A plan had been conceived shortly after Charlemagne's coronation to combine his empire with the Byzantine empire through his marriage to the Eastern Empress. Irene (780-802). But the plan failed when she was overthrown. During the last four years of his life, Charlemagne is subject to frequent fevers. On the 28th day of January, in the year 814, the great Emperor dies at nine o'clock in the morning. His death occurs in the 72nd year of his life, and the 47th of his reign. The Emperor is buried in the church he built at Aachen, sitting upright with sword in hand. His mammoth achievements will be lauded in popular legend and poetry for centuries to come. Charlemagne has not ended an age; he has begun one. He will be called rex pater Europae — "King father of Europe." He has shown Europeans an ideal. He has bequeathed to them a common cultural and political tradition. Even in the distant 20th century, men will point to his model as a blueprint for European unity. Charlemagne has left his mark on European history as no other man. He has, in large measure, determined the political fate of Western Europe. Justinian's "Imperial Restoration" in A.D. 554 fell apart almost immediately upon his death. Charlemagne's empire survives him by only one generation. This cyclical pattern of revival and disintegration will be often repeated in centuries to come. Charlemagne is succeeded by his son Louis the Pious. The well-meaning but weak Louis is dominated by his wife and by churchmen. He possesses no qualifications for governing the empire to which he succeeds. Louis dies in 840. Civil war breaks out among his three sons. In 843, the Treaty of Verdun settles the quarrels among Louis' sons. It divides Charlemagne's empire into three parts — one for each of his grandsons. In short order, however, Europe crumbles into scattered feudal states. The Carolingian Empire disappears. The political unity of Christian Europe becomes a thing of the past. In its weakness, Western Europe falls victim to invasions by Northmen, Saracens and Magyars. The Continent is again a political shambles. The Papacy is also in trouble. The Holy See is increasingly torn by factionalism. Intrigue becomes rampant. The papal office is bought and sold — and occasionally obtained by murder. 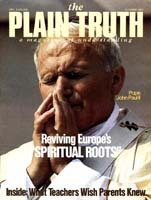 The corruption and immorality of the Papacy during this period will prompt later historians to call it a "pornocracy"! The infamous "Cadaver Synod" serves as a bizarre illustration of the turmoil in Rome. The body of former Pope Formosus (891-896) is exhumed by newly elected Pope Stephen VI late in 896 and put on trial, charged with treason! The corpse is dressed in papal regalia, assaulted with questions and accusations, then dragged through the streets of Rome with a mob cheering on! The next year, Pope Stephen is himself overthrown, imprisoned and strangled. Sergius III, Pope from 904 to 911, attains the office after ordering the murder of his predecessor. His life of open sin with the noted prostitute Marozia brings widespread disrepute upon the Papacy. Sergius fathers a number of sons by Marozia, among them the future Pope John XI. Sergius reign begins a period. known as "The Rule of the Harlots." Chaos reigns in Rome — and throughout Europe. The situation is grave. It becomes clear to many that the disunity and weakness in Europe is tied closely to the disunity and weakness of the Church — and vice versa. Perceptive churchmen realize that they must call in a strong prince to again unite Europe. Western civilization must be saved! With the Frankish realm in eclipse, Rome must look elsewhere for a champion to resurrect the tradition of imperial unity. When the next great Emperor appears in Western Europe in the middle of the 10th century, he will not be a Frank, but a Saxon German. As medieval Germany rises to a predominant position in the West, the dignity of the title of Roman Emperor will become permanently connected with that of the king of Germany.